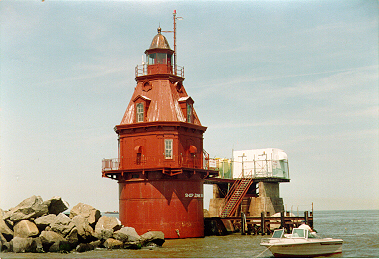 This Delaware Bay Lighthouse was named after a ship, the Ship John. The vessel was built in Massachusetts, and was under the command of Captain Folger, and was carrying a cargo of glass, hollow ware, gin, iron sheeting cloth, toys, nails and window glass from Hamburg, Germany to Philadelphia when it grounded on a shoal near the mouth of the Cohansey Creek in December, 1797. Aboard were about 60 German passengers. Vessels from Greenwich, New Jersey rescued the passengers and Captain, and salvaged some of the cargo. By spring, the ship had been cut through by heavy ice and storms and gradually it settled into the sand. Drifting sand accumulated around the wreckage increasing the area of the shoal. After the ship was sunk a wooden lighthouse was placed there to mark the shoal, but in 1876 the wooden lighthouse was destroyed by ice. A lighthouse was finally built in 1877 on a caisson foundation. A steel cylinder was sunk 30 feet below the surface of the water and filled with rock. This foundation was then surrounded by rip-rap, to ward off ice flows and protect the structure from sea action. The light flashes white on the channel side and red on the shoal side, and is of 20,000 candle-power. The lighthouse is also equipped with compressed aid fog-horns which emit a blast every 20 seconds when in use. A Victorian-style cottage sits atop the caisson foundation, and has a copper roof, and quaint panel windows. On a rip-rap island next to the lighthouse are tanks for fuel. The Cumberland County Historical Society has the wooden figurehead of the Ship John as well as a bell from the Ship John Lighthouse. The Cape May Historical and Genealogical Society Museum at Cape May Court House, New Jersey, has the frame of the ships rudder, which was retrieved some years ago when it appeared in an oyster dredge and was brought to the surface by Captain Zadak Sharp. It was presented to the museum in 1930.